Congratulations to Stella Duffy, a keen supporter of the Friends, on being made an OBE in the Queen's Birthday Honours. Awarded for services to the Arts, the citation lists her as “Writer and Theatremaker”, which gives only a small idea of her many accomplishments. 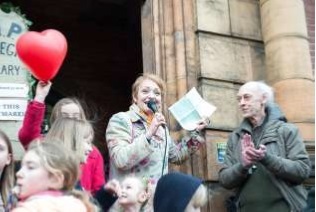 Stella has long been associated with Carnegie Library, hosting workshops, giving readings and attending events over the years. As Director of Fun Palaces, she inspired the hugely successful Fun Palace Day at Carnegie Library and all Lambeth Libraries on 3 October 2015. More recently, she spoke at rallies and signed up 220 authors to a letter supporting libraries and opposing closures. A full appreciation will appear in our next Newsletter. In the meantime, we salute our dear friend and neighbour on her well deserved honour.